Dell will do $57billion in revenue this year. Apple will do about the same, on a calendar basis. Yet Apple's stock market value is $175billion, about 7times the market value that Dell has. The reason? Margins. 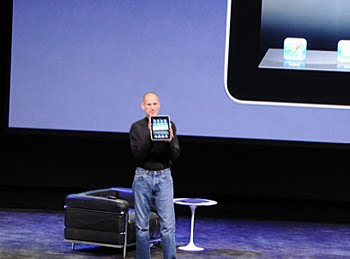 Dell's most recent quarter saw 17% gross margins while Apple's clocked in at 41%. 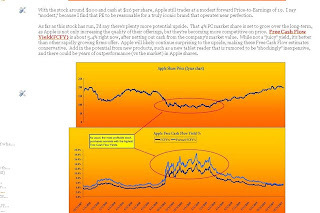 Below is a discussion of how Apple prevents its wares form being commoditized like Dell's. Oh and in full disclosure, I'm long Dell instead of Apple, thanks to Dell's juicy Free Cash Flow Yield. 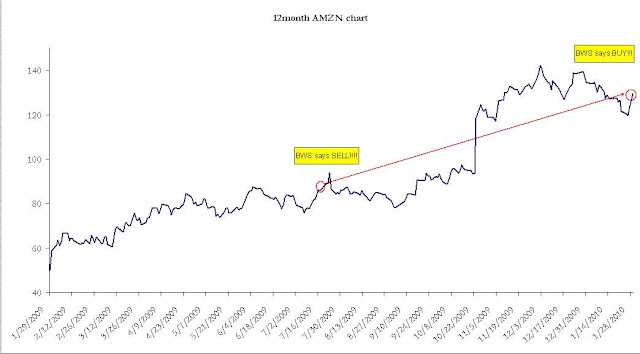 Amazon beat consensus earnings last night by about 15cents per share for the fourth quarter, and revenue of $9.5billion came in above the $9billion expected by the street. Company-wide gross margin jumped .7% from a year ago to 20.8%, led by North America which jumped to 23.6% from 21.5% a year earlier. International gross margin dropped almost a percent, to 17.7%. The analyst community, as usual with Amazon, is deliberating over how much of a premium the shares deserve to other stocks - a game that i have no idea how to play. Among analyst reactions, one guy that's not having a great morning is Hamed Khorsand of BWS financial. He upgraded the shares to STRONG BUY today. Not a BUY, but a STRONG BUY. This is coming off the SELL rating he stuck with since late July of last year. Hmmm, in (an attempted?) defense of his call, I note that he downgraded the stock back when its forward PE was about 42, and is upgrading it with the forward PE at about 36....hey i tried. The company cited BIG operating and free cash flow, but it's important to note that a full $1billion of the company's $2.9billion in Free Cash Flow was due to extending accounts payable. More to the point, they extended it by an EXTRA billion compared to how much they pushed it out last year. I certainly won't scoff at this impressive working capital management, but it's often not sustainable to this degree, so it's best to adjust the free cash flow for investment decisions. 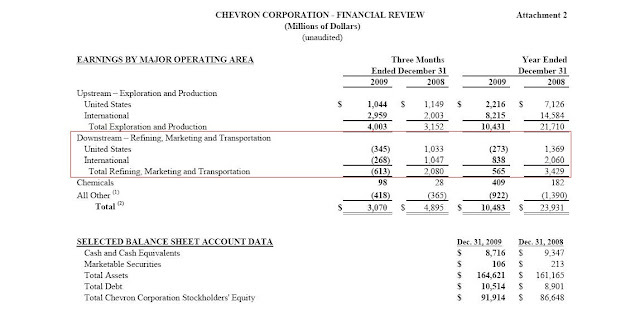 DJIA member Chevron Corp (CVX) reported "muddled" earnings this morning, but it looks like they beat expectations. At first glance, earnings of 1.53 per share look lighter than the 1.70 the Street was expecting, but after pulling out 20cents per share in charges, they came in ahead of expectations. Refining margins were absolutely disastrous this quarter, as expected. For the fourth quarter, downstream (Refining, marketing and transportation) lost $613million, versus a profit of $2.08billion a year ago. Jaysus. 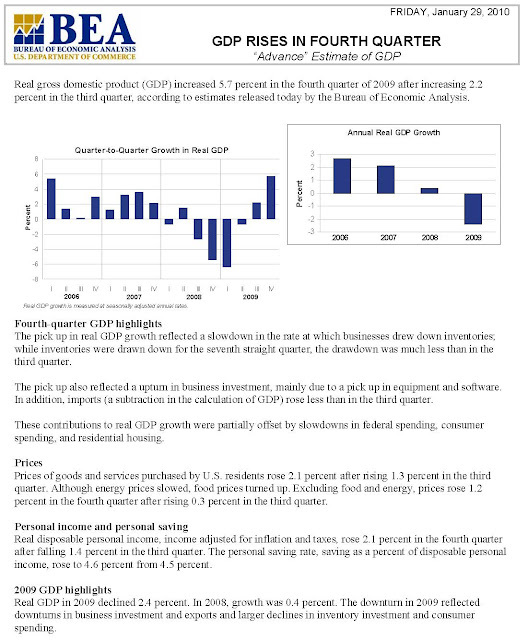 Q4 2009 GDP +5.7% versus 4.7% expected. 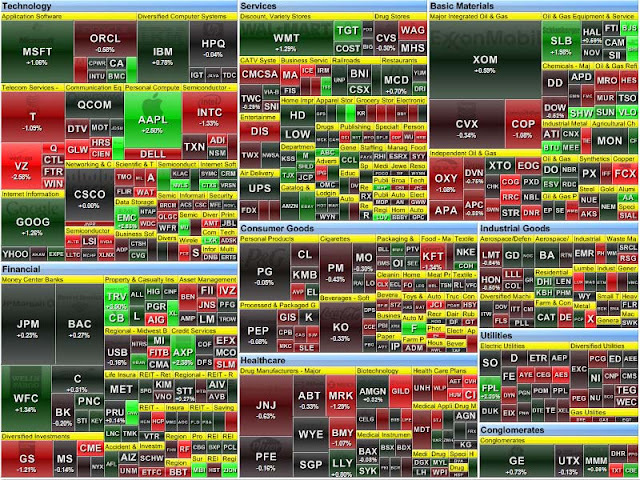 Markets like it. US indexes are about about 75basis points each, on the heels of this morning's better-than-expected GDP report from the Bureau of Economic Analysis. More than any other reason, a slowdown in inventory reduction was the reason for the big number. In denial, Greece claims a conspiracy theory. China shouldn’t buy a “large chunk” of Greek government debt to help rescue the nation because the securities are more risky than U.S. Treasuries, said Yu Yongding, a former adviser to the Chinese central bank. Greece has a lower debt rating than the U.S. and its statistics have been “sharply” criticized by the European Commission, said Yu, currently a member of the Chinese Academy of Social Sciences, a government-backed research body. The Greek Finance Ministry yesterday “categorically“ denied a report in the Financial Times that it is wooing China to buy as much as 25 billion euros ($35 billion) of its bonds. While the market is getting trounced today - especially tech shares - Amazon is a lonely positive name, trading +1.6%. It's likely due to yesterday's over-reaction to the Apple event, and partly in anticipation of big earnings results this afternoon. Collins Stewart estimates that Amazon's kindle - the product under direct assault from Apple's new product offer - will amount to about a $1billion in revenue this year, and $250million in gross profit. 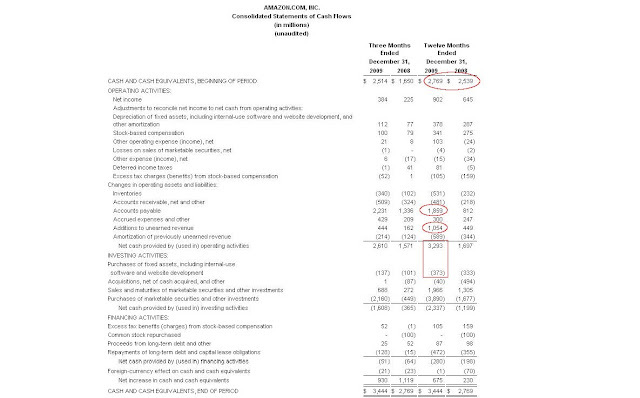 Take the company average share of operating expenses applied to this gross profit, and I'd estimate Kindle-related earnings per share are about 10cents, out of 2010's full year estimate for 2.60 for Amazon. Small change, even if sales form Kindle evaporated completely. Amazon reports tonight, we'll see if there is an inordinate amount of Q&A on this subject. Markets down as durable goods orders disappoint. Tech orders especially weak. US stocks are down today, with the DJIA off 1.5% and the Nasdaq off 2.4%. 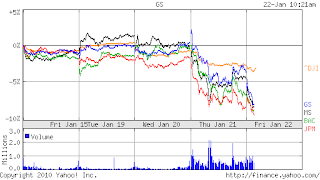 Apple's (AAPL) heavy weighting is hurting the tech indexes, as its shares are off 4% today, giving back yesterday afternoon's post-iPad gains. 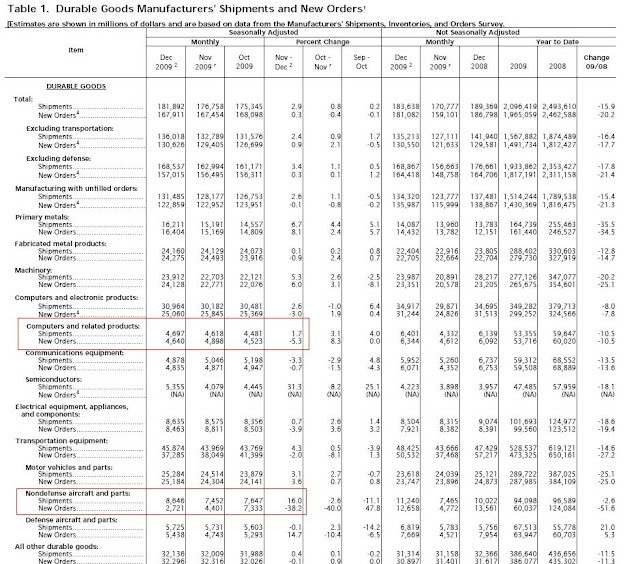 Durable goods orders for December came in at +.3%, a far cry from the estimated +2%. Especially weak were aircraft orders and computer-related orders, which might be why tech shares are off much more than other sectors today. Communications tower-operator Crown Castle (CCI) is down 3.5% this morning, despite beating Street estimates on revenue and "earnings." That's in quotations because CCI doesn't "do" earnings due to massive depreciation and amortization expenses. The conference call is going on right now, and management is citing studies about the growth of smartphones and their "insatiable" appetite for bandwidth - bandwidth that must run on CCI's towers. The difficult thing with this company is reconciling the excellent growth prospects with the razor-thin margin of error they've left themselves with regard to debt payments and leverage ratio's. 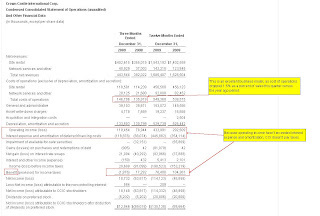 Crown Castle's cost of capital must be calculated to be around 8%, and their Free Cash Flow Yield is below that - even with taxes being a benefit instead of a provision (they don't pay taxes, but rather get a credit against future taxes). Despite today's drop, CCI shares are up 16% since I called them overpriced on November 3rd. Right or wrong, always honest. I believe now as I did then that this is a leveraged finance company. They have beautiful cash flows, but are levered to the moon. The company's market value is $10.7billion and total debt outstanding is about $7billion. 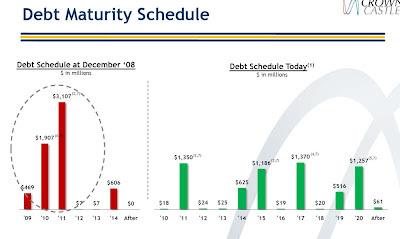 Most important for this firm and its investors is the massive debt burden, and its maturity schedule. Less than a year ago, shares traded at levels suggesting a bankruptcy. In 2009, management did a masterful job in the debt markets, pushing off debt maturities and achieving a weighted average interest rate of 5.75%. The extension of maturities did come at a heavy cost, as q4 interest expense of $118.9million was an increase of 35%. Looking at the q4 results, gross margin has improved by 1.6%. The firm's operating model is juicy, as the same rental site adds more and more tenants. Capital expenditures were down 60% in 2009 versus 2008, and that's not a sustainable decline. 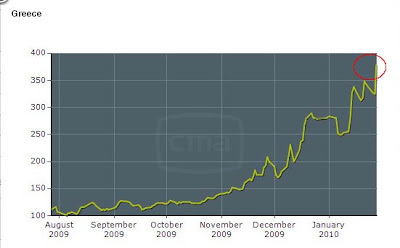 Look - CCI is in a marvelous business, but as I said above they are leveraged to the moon. If they actually paid taxes they would be dangerously close to breaking loan covenants. Not my cup of tea. After trading down most of the day, Apple just exploded higher when the $499 entry-level price for the 16gig Ipad tablet reader was announced - literally HUNDREDS of dollars cheaper than expected. Putting this device within a couple hundred dollars of the competition is a huge deal. Why pay a little less for an Amazon kindle when for $100 more you get Apple's elegant design and impressive technical edge? Apple shares just jumped to $208 from about $200 an hour ago, while Amazon shares are off $3 from their intraday high, as Apple's aggressive pricing will wage war on their successful Kindle. CAT posted earnings per share of 41cents for the fourth quarter, handily beating the consensus estimate of 28cents. Revenues came in about $200million below the $8.1billion the Street was looking for. For 2010, CAT estimates earnings of 2.50 per share, a bit below the Street average estimate of 2.70. Revenue guidance is a range of +10% to +25% versus 2009's $32.4billion - so a midpoint of $38billion versus the street estimate of $36billion. 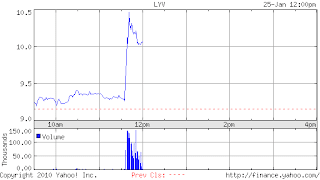 That 10-25% increase in revenue is being scoffed at this morning, part of the reason shares are down 6%. 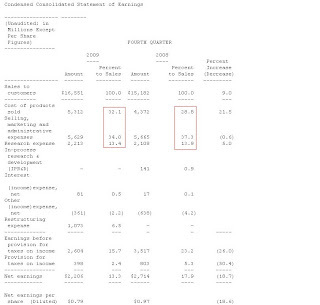 In q4, CAT was still able to handily cover its interest payments, to the tune of about 7.5times. CAT cites an uptick already in aftermarket service parts and sees this as an indicator of growing demand...but it also must be seen as an indicator of "fix-it versus buy-a-new-one" mentality. 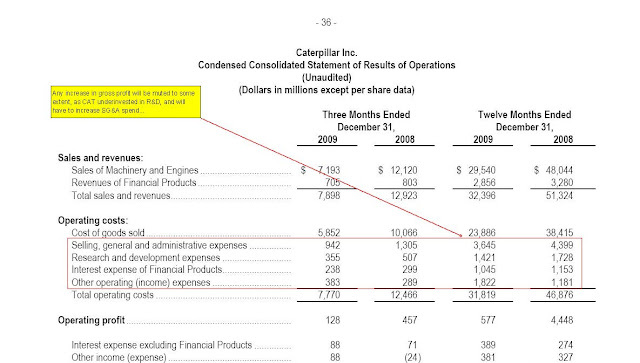 Below is from the company's earnings presentation comparing 2009 operating income to 2008. 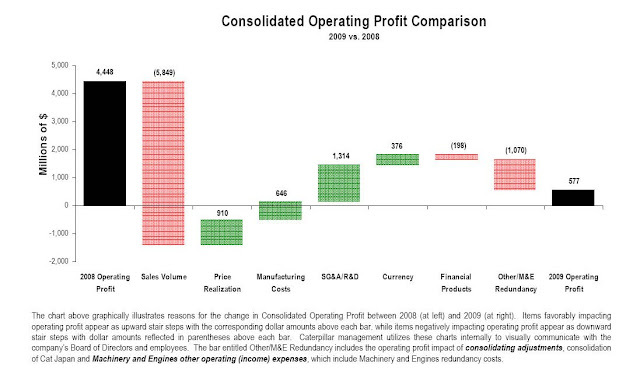 The red bars show negative drags on operating margin, while the green shows positive impacts. CAT's focus on procurement, manufacturing efficiencies and reductions in headcount could lead to a springboard effect if sales turn around. I wouldn't touch the shares here. Sure, if management hits the $60billion revenue mark in 2012 they will have proved the naysayers wrong. But a more rational look at earnings possibilities over the next couple years leaves the shares more than fully valued at current levels. "Standard & Poor’s and Moody’s Corp. won dismissal of a lawsuit seeking to hold them responsible for defrauding investors who bought about $100 billion of mortgage- backed securities. At a hearing today, U.S. District Judge Lewis Kaplan in New York said he would dismiss claims against the rating companies, according to a clerk for the judge.Lehman Brothers Holdings Inc., which was alleged to have once owned the bonds that were sold, is bankrupt and not a defendant in the case. “We are pleased the judge granted our motion,” Chris Atkins, a spokesman for S&P, a unit of McGraw-Hill Cos., said in an interview. Michael Adler, a spokesman for New York-based Moody’s, didn’t immediately return a call. Investors in the mortgage-backed securities claimed in their lawsuit that S&P and Moody’s misled them by disregarding ratings guidelines, serving conflicting roles in evaluating and structuring the bonds, and sacrificing their independence." S&P Official #1: Btw (by the way) that deal is ridiculous. S&P Official #2: I know right...model def (definitely) does not capture half the risk. S&P Official #1: We should not be rating it. S&P Official #2: We rate every deal. 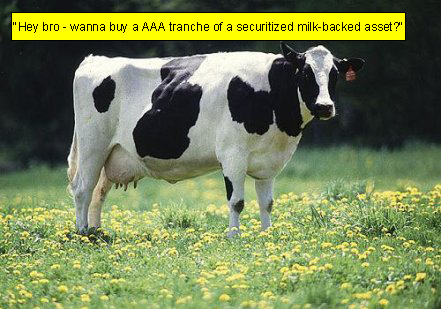 It could be structured by cows and we would rate it. "If your product is a stamp of approval where your highest rating is a curse to those that receive it, and is shunned by those who are supposed to use it, you have a problem...The truth is that nobody I know buys or uses Moody's credit ratings because they believe in the brand. They use it because it is part of a government created oligopoly and, often, because they are required to by law...The real value of Moody's lies in its ability to cow the authorities into preserving its status." Parlux Fragrances (PARL) just announced that the CEO is leaving and that they had to "erase" some revenue. Nice. FORT LAUDERDALE, Fla., Jan. 26, 2010 (GLOBE NEWSWIRE) -- Parlux Fragrances, Inc. (Nasdaq:PARL - News) announced today that Mr. Neil J. Katz has resigned from his position as Chairman and Chief Executive Officer of the Company due to philosophical differences regarding the future direction of the Company. Mr. Katz had held this position since July 2007, and has been instrumental in acquiring a number of new licenses during this period. Mr. Katz, who is expected to remain with the Company as a Director and consultant, stated, "A number of opportunities have arisen which require my attention. Parlux is a fine company, and I anticipate being able to assist the Company during this transition and in the future." 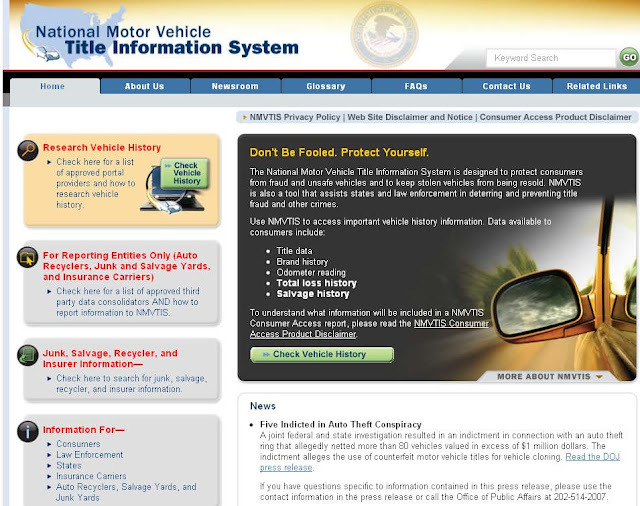 The Company also anticipates reporting its earnings for the three and nine months ended December 31, 2009 on February 3rd, 2010. The Company notes larger than expected product returns from U.S. department store customers have reduced the Company's net sales for the third quarter ended December 31, 2009 to approximately $50 million from the previously announced estimate of $52 million, and it expects to report a net loss for that quarter of approximately $5 million." Just a couple minutes ago, it was announced that Berkshire Hathaway B shares (BRK.B) will be added to the S&P500 index, a move Warren Buffett didn't deny was coming when interviewed a few days ago on CNBC. 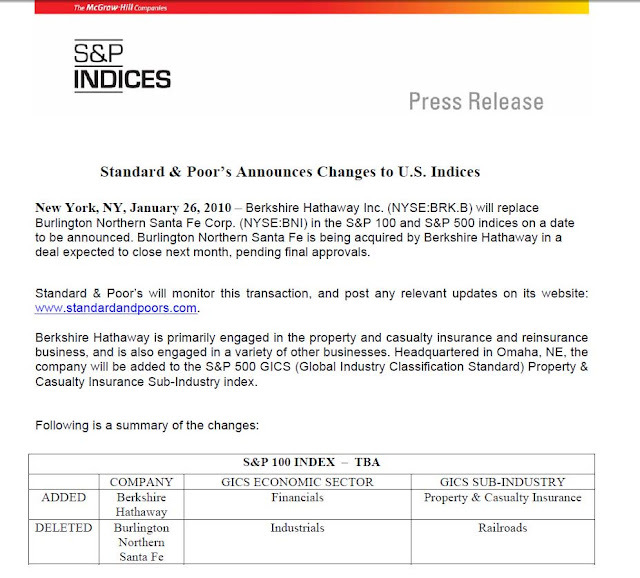 And what shall Berkshire Hathaway replace in the index? Why, Burlington Northern (BNI), which is being acquired by Berkshire Hathaway. But fourth quarter revenue did increase from the year-ago period. JNJ is facing challenges on multiple fronts. It's prescription drug business continues to face challenges from generic competition, and this will only get worse if the president gets his way on shortening patent protection timeframes. The company is also not immune to the weak economy, as elective surgeries see a decline, and their consumer division is challenged by trade-downs to private label products. Everything from contact lens sales to diabetes-test strips are under pressure, as more and more healthcare items become "discretionary." 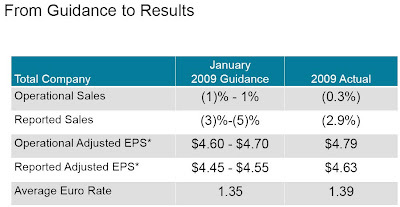 On thing I like right off the bat from their earnings presentation is the comparison of their original guidance to actual 2009 results - they came in VERY accurate on their predictions, giving us confidence in future guidance. 2010 Free Cash Flow Yield, based on by FCF estimate of about $13.8billion, is a FAT JUICY 8.6%. The denominator I use is Market Value - Cash, causing people to wonder why I net out cash but don't add back debt. I exclude debt because if you bought the company and assumed the debt, they still earn 53times their quarterly interest payments. 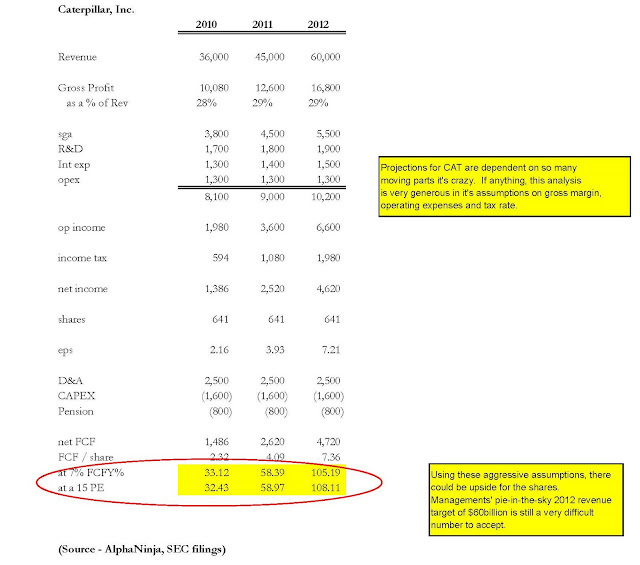 That 8.6% Free Cash Flow Yield is far too rich for a company like this, despite clear headwinds. So what's an appropriate yield? I'll look to their debt, with full knowledge that it's overpriced. JNJ's 2029 6.95% notes are trading at 123cents on the dollar, to yield 5%. I think a Free Cash Flow Yield (FCFY) is easily fair for this company, suggesting a stock price of $75 a share once cash is added back. That's a 20% gain and only a Price-to-Earnings ratio of 14 for a world class company. Stocks like this are why I see bigger gains ahead for the DJIA. After a weak start, the DJIA is up about half a percent. Several Dow30 components have reported earnings. Johnson & Johnson (JNJ) shares are down but rebounding, after beating EPS expectations by 5cents. The weakness in shares is likely due to tepid 2010 guidance, which disappointed some investors. Dow30 member Travelers (TRV) beat BIG, with q4 earnings of 2.12 per share versus the street expectation of 1.49. Says the firm, ""Our retention rates remained high and the impact of renewal rate changes on premiums remained positive across all three of our business segments. This pricing dynamic is generally better than recent industry surveys." The weakest DJIA member is Verizon, off 2.6% despite a generally in-line quarter. Investors may be unexcited about the necessity of continued massive CAPEX, and the potential for margin destruction when the firm offers its customers the iPhone. Peter Wallison of the American Enterprise Institute has a great take on the activities of banks, and why the government has had a role in limiting their opportunities. "Banks have been committing themselves increasingly to financing real estate. The reason for this is simple. Because they cannot underwrite or deal in securities, they have been losing out to securities firms in financing public companies—that is, most of American business other than small business. It is less expensive for a company to issue notes, bonds or commercial paper in the securities markets than to borrow from a bank. Where, then, can banks find borrowers? The answer, unfortunately, is commercial and residential real estate. Real-estate loans rose to 55% of all bank loans in 2008 from less than 25% in 1965. These loans will continue to rise in the future, because only real-estate, small business and consumer lending are now accessible activities for banks. This is not a good trend, because the real-estate sector is highly cyclical and volatile. It was, indeed, the vast number of subprime and other risky mortgages in our financial system that caused the weakness of the banks and the financial crisis. Requiring banks to continue to lend to real estate, because they have few other alternatives, virtually guarantees another banking crisis in the future." The most vocal opponent to the deal was competitor Anschultz Entertainment Group, whose CEO said last year that the deal was "not good for the industry." In an attempt to secure DOJ approval, it appears that last week LiveNation was offering Anschultz some of its locations in order to gain favor. It's not clear if any assets changed hands yet, but the NYPost suggested that Anshcultz was cleverly trying to pick up assets on the cheap. Nice move if that's true. US indexes are positive this morning, with the DJIA +46points or +.46%. Not much news behind today's gains, but rather a bit of recovery after last week's harsh selling. General Electric(GE) and Caterpillar(CAT) are the DJIA's biggest gainers. GE estimates were raise at UBS this morning, as the firm sees improving results in Capital Finance. 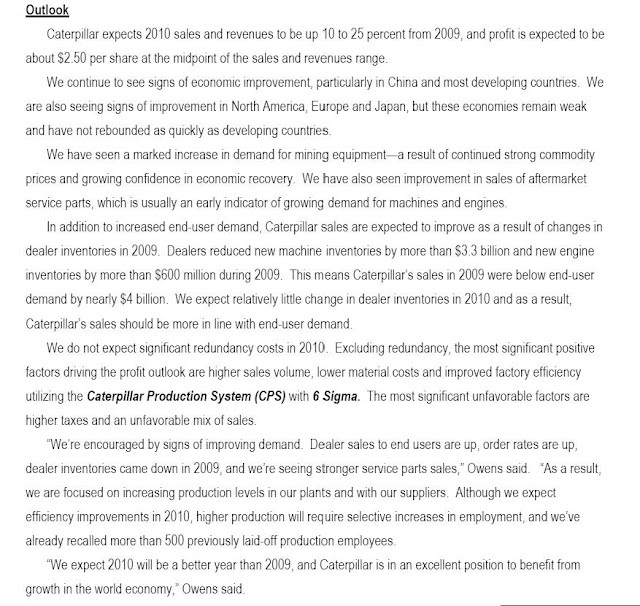 Goldman Sachs is also out with positive comments on GE today, saying earnings will increase thanks to lower tax rates and improving industrial results. 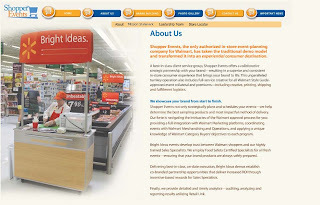 Wal-Mart (WMT) is in the news this morning, after a weekend announcement that they'll lay off 11,000 people. The headline news is not nearly as bad as it sounds on the job front, as most of these positions in food demonstration will be outsourced to Shopper Events, who if they were publicly traded would likely be up massively today. Bank stocks are off nearly 10% in just a couple days, taking a cue from President Obama's new threats to reign in activities at the largest US institutions. The finer points of the administration's plan will - like healthcare, like the stimulus - be figured out by someone else, but in general the idea is to restrict the investing and trading activities of banks that access the Fed discount window or rely on FDIC insurance, etc. Again, these are "best-guess" estimates, as the details have yet to be determined. Some are rightly pointing out that actions like this might not have prevented the financial sector meltdown anyway. Bear Stearns, for example, wasn't accessing the Fed discount window or enjoying FDIC backing - they just bought a LOT of garbage. "I would say pure walled-off proprietary-trading businesses at Goldman Sachs are not very big in the context of the firm," David A. Viniar, the firm's chief financial officer, said in a conference call. Bank stock shareholders should take comfort that everyone from Geithner to Bloomberg to Barney Frank are coming out against this new attack on banks. And even if some sort of new restrictions on bank involvement in private equity or principal transactions is enacted, the negative effect to earnings will be very small.